The 1st century BCE historian Strabo described the Nabateans as being ‘temperate and industrious,’ although the king enjoyed a luxurious lifestyle, dressed in purple (a luxury in those days), drinking wine in golden beakers and being entertained by dancing girls. The Nabatean cities were situated along the old spice routes from the Yemen to the Mediterranean, by which the Three Wise Men were supposed to have travelled on their way to Jesus’s birth in Bethlehem, bearing their gifts of spices – frankincense and myrrh – and gold. Modern vineyards were first replanted in the Negev in 1988, with nine vineyards and several small producers today located along the spice route. Heat, water and marauding camels are the amongst the biggest challenges (apparently the salt levels in the water make the grapes sweeter?). I am looking forward to trying out these wines. The story of the Three Wise Men bearing gifts was super-imposed by St Augustine, in the 4th century, on to the pre-Christian mid-winter festivities. Later, Epiphany was set to 6th January, marking the end of the twelve days of Christmas. Initially, only royalty and the wealthy had such celebrations, giving gifts and having elaborate feasts. 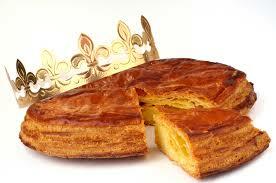 During this time, the king cake (galette des rois in France) evolved as a traditional dessert. The pagan connections with the celebrations around the winter solstice led to continuous criticism by religious leaders of these festivities. The bean was a fertility symbol in Greek and Roman times, later placed in galettes des rois. The link with the king and crown has various traditions – the Epiphany story of the Three Kings, that it was a traditional day for the feudal toast of allegiance and the pre-Christian tradition of being the one day when whoever wins the crown – even if only a servant – is treated as a real king for the day. Galettes des rois in various forms are found throughout the Catholic world. Today there are two different cakes popular in France. In 16th century Paris, the galette des rois was at the centre of a conflict between the patisseries (cake shops) and the boulangeries (bakeries). This led to the tradition of two very different cakes; one made with flaky pastry with an almond frangipane filling (popular in the north of France) and another, a circular bready brioche, flavoured with orange flower water, decorated with glacé fruit (popular in the south of France). Originally the Provençal cake was a sweet fougasse (like one made for the 13 desserts) made Roman-style by being baked in the embers. King cakes have been sold with a golden paper crown since the end of the 19th century, and this is given to the person who finds the fève (broad bean), baked in the cake. Even though the trinkets in the cake are no longer beans, they are still called fèves. At the end of the 19th century, the beans were replaced by porcelain figurines, originally representations of the baby Jesus (again a reference to fertility?). They might be tiny china santons (nativity figures), animals, or cartoon characters. At the beginning of the 20th century, a Mr Lion launched fèves which included advertising. In 1960 the first plastic figures appeared – cheaper to produce – but not as collectable as the porcelain figurines. Mind your teeth, however, if the fève is porcelain! A French joke tells of a patient, having broken his tooth on a fève, visiting the dentist. and being told: “You’ll need a crown!” The only cake served at Epiphany without a fève or king is the galette d’Egalité served at the presidential palace. The tradition of the hidden ‘treasure’ in the festive cake is found in many places. Britain had its tradition of the silver sixpence in the Christmas pudding (only possible until the silver was removed from sixpences in 1948). Galettes des rois are good accompanied with sweet wine, such as vin cuit, or – to go with the orange flavours of the brioche cake – an orange muscat. Champagne adds a festive touch. Now, I wonder if any sweet wines are made along the Nabatean spice route…? Nice site and love the connection between wine & history beeing a #winelover and arcaheologist. Thanks Magnus! It was also great getting to Avdat a few weeks later and seeing the spice route. Excellent piece Elizabeth 🙂 Very informative.